Bibb County is the setting for the hit podcast "S-Town"
This Wednesday, May 3, 2017 photo shows the grave of John B. McLemore, who is featured in the serialized podcast "S-Town." Dimes, rocks and trinkets have started showing up on McLemore's headstone since the debut of the podcast after his death. Residents of the rural area depicted in the show are uneasy with their rural community being portrayed as a lousy place best described with an expletive. Attention is often a hard-won commodity out in the country, and sometimes it's the last thing a little town wants. Residents puff out their chests when a high school in a rural town upends a big-city rival to win a championship, but they're just as likely to be deflated by some dash of infamy — a tornado that wipes out a trailer park or a neighbor who winds up on a wanted poster. A central Alabama community is grappling with a version of the latter — the unwanted fame that comes from millions of people knowing it only as a lousy, scruffy place best described with an unprintable expletive. Bibb County is the setting for the hit podcast "S-Town," with the "S'' standing for a vulgar word for excrement. The seven-part show was produced by Serial Productions of the similarly popular podcast "Serial" and "This American Life." In this Wednesday, May 3, 2017 photo, Jimmy Frank Hicks, left, and nephew Tyler Goodson of the hit podcast "S-Town" stand at the grave of friend John B. McLemore, who is also featured in the serialized show. Downloaded more than 40 million times in 114 counties since its release in late March, "S-Town" is the first podcast to reach that level of distribution so quickly, according to Podtrac, which analyzes podcasts. More than three-quarters of those downloads were in the United States, with the United Kingdom, Canada and Australia rounding out the top four. The podcast focuses on the towns of Woodstock and Green Pond, where strangers now stop by occasionally to take selfies at locations from the show or put a dime atop the grave of the main character, John B. McLemore, who died before the show came out. No one is complaining about that. But having your hometown portrayed as a backward, misogynistic, racist, homophobic, corrupt backwater — at least one view expressed in "S-Town" — is wearing on folks, particularly those who understand that things can live forever on the internet. "Nothing good will come of it," said Keefe Burt, a county commissioner whose family is mentioned unflatteringly in the show. Repeatedly. Some view the podcast and its name as a "black mark" on the community, said barber Robert Browning. This photo taken Wednesday, May 3, 2017 shows a statue of Jesus near the grave of John B. McLemore, who is featured in the serialized podcast "S-Town," in Green Pond, Alabama. Dimes, rocks and trinkets have started showing up on McLemore's headstone since the debut of the podcast after his death. "There's quite a few people who took offense to it, and there's a lot of people who just don't care," said Browning, a pro crappie fisherman when he's not cutting hair. Bibb County officials have been working for years to shine a spotlight on their community. It's home to about 23,000 residents, many of whom make an easy work commute to Alabama's biggest city, Birmingham, or its flagship school, the University of Alabama, each less than 35 miles away but in opposite directions. The only Mercedes-Benz car factory in North America is just a few miles away, and a supplier to the factory is moving into Bibb County's new industrial park. Other companies are looking, too, Burt said, unfazed so far by "S-Town." In Woodstock there are medical offices and a grocery store and antique shops, making it a lot better off than many other towns its size. Unemployment isn't bad in the county by Alabama standards: 5.4 percent last month. But that "S-Town" image is grating on some people, and it all goes back to McLemore. "S-Town" tells the story of an alleged murder and another death, and winds up focusing on McLemore's tortured relationship with the town of Woodstock, his own inner demons, and a younger man named Tyler Goodson. Goodson said he's gotten used to people stopping on the road outside his home to take photos, just as people who live around McLemore's old home sometimes have to avoid cars stopped in the road to take pictures of the locked gate. Reporters are a near-constant sight at Woodstock City Hall, where workers are happy to chat about the show as long as their names aren't used. If any place has become a pilgrimage site for fans, it is McLemore's grave, atop a hill just inside the gate to Green Pond Presbyterian Church Cemetery. 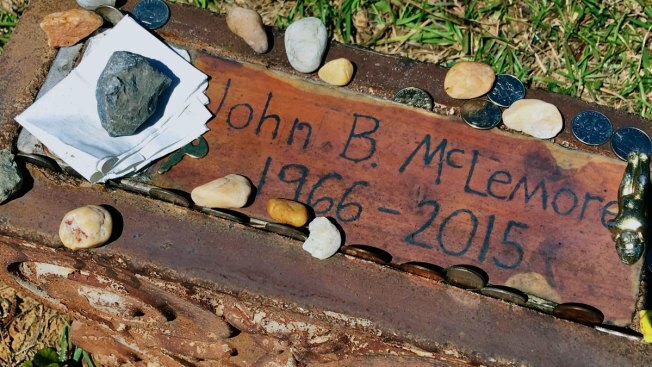 Goodson made McLemore's tombstone, which has been decorated with coins, stones, a note, trinkets and a 45-rpm record in the weeks since "S-Town" was released. "I don't know who's leaving all that stuff. It's not me," Goodson said at the graveside, where he'd stopped to pay his respects accompanied by uncle Jimmy Frank Hicks, another person featured on the show. Just down the hill, Terry Fortenberry doesn't know why people are going to the cemetery so often. Fortenberry, who doesn't listen to podcasts and spends his days selling knick-knacks beside the road, said Woodstock and Green Pond seem nice enough to him, certainly not worth calling "S-Town." "It's better than that. The people are better," said Fortenberry, 58. Goodson, 26, isn't so sure. He faces felony charges related to something that happened while the podcast was being produced, with a court date set for next month, and he no longer has his old friend John B. McLemore to talk about it all with. "S-Town," neither the community nor the podcast, have done him any favors, Goodson said. "It's a sad story, especially if you're part of it," Goodson said.